Marc Jacobs Highliner and Fineliner Best Waterproof Gel Crayons! When I wanted to learn how to tightline my upper and lower eye waterlines, I was using my everyday black eyeliners, and I had a lot of problems with my eyes tearing and burning. I went to my amazing girls at the Sephora in King of Prussia to ask their advice on the right kind of tightlining eyeliner, and all of them agreed that the Marc Jacobs Highliner Waterproof Gel Crayon ($25), and if I wanted a finer line, they suggested the Marc Jacobs Fineliner Ultra-Skinny Gel Eye Crayon EyeLiner ($24), which is modeled after the Highliner, and is also waterproof, but it has an uber skinny 2 millimeter unbreakable tip. I purchased both because I wasn’t certain which one would be easier to draw the line with. I, of course, was most interested in the black shades for tightlining. Both Gel Crayons are waterproof, which is really important for tightlining. They are also quick-setting, they take only 15 seconds to set. Once they set, they do not smudge, and they last and last, and it takes a really good eye makeup remover to get them off! 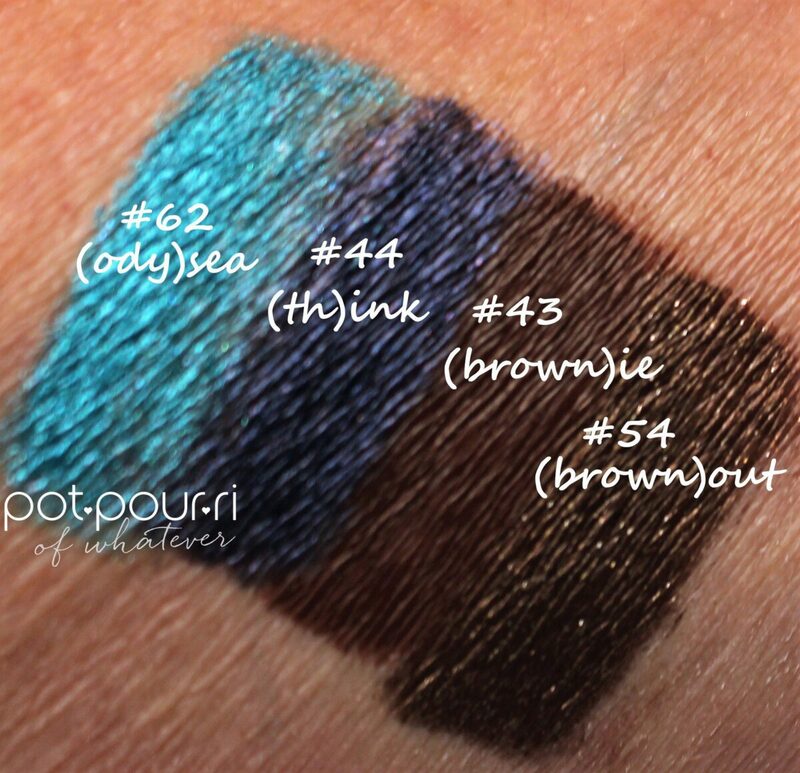 I also purchased two brown liners, as well as a navy blue, and a teal eyeliner in the shimmer finish. 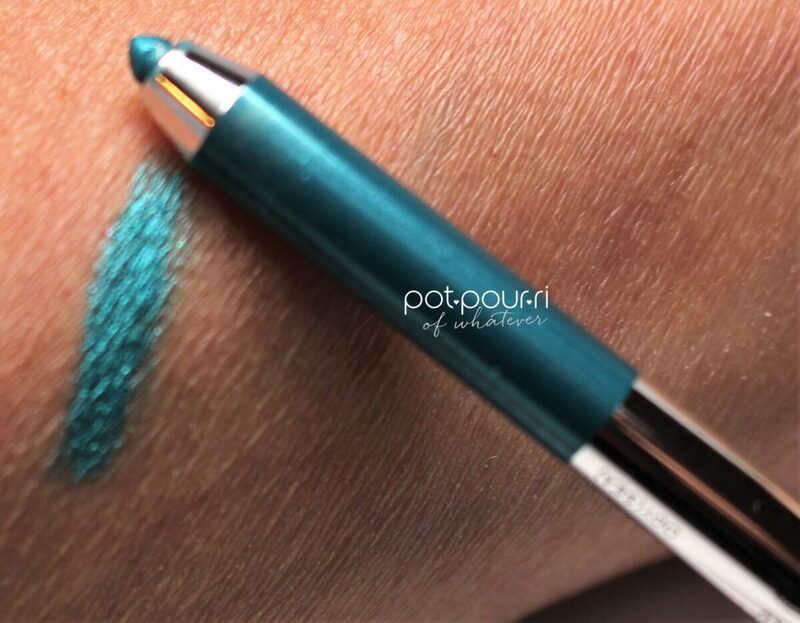 The highliner comes in three finishes; 12 shades are in the matte finish, only the Blacquer is in a Satin Finish, and 21 shades have a shimmer finish. There are 7 fineliner shades. 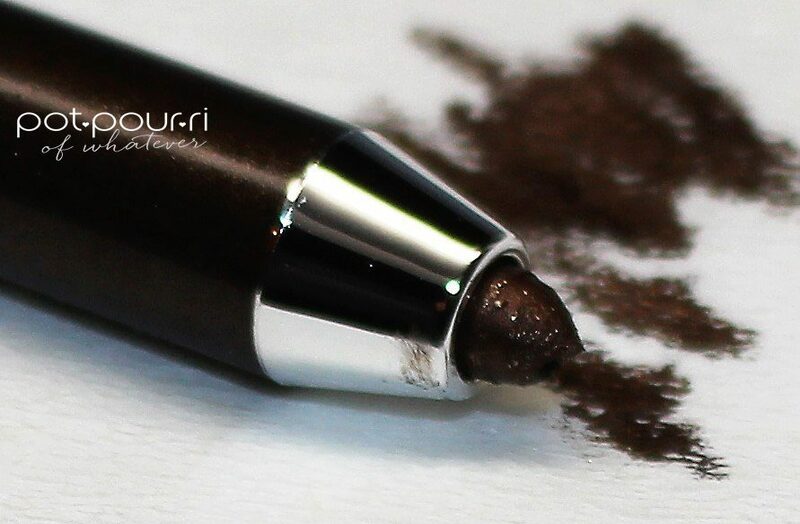 If you are going to use this pencil as an eyeliner, it is important to always sharpen it, to make certain there is no bacteria on it, and it is easier to line your eyes with a pointed liner. The formula of the highliner is so soft and malleable, it is easy to sharpen the crayon just by rubbing the crayon, against a tissue, while turning it, to carve out a point. It sounds harder than it is! Gently turn the pencil, continuously, against the tissue, until you have carved yourself a nice point! The formula for the gel crayons is conditioning for your eye skin, as it contains Vitamin E and Rosehip seed oil. The crayons are richly pigmented and have intense color, and go on smoothly. They’re easy to apply. There is no tugging, which is a pet peeve of mine, I detest when an eyeliner is so dry it tugs the eye, but the formula of these crayons is so creamy, they color just glides on. Like I said above, there is a 15 second dry down time, so you can play with them a little. 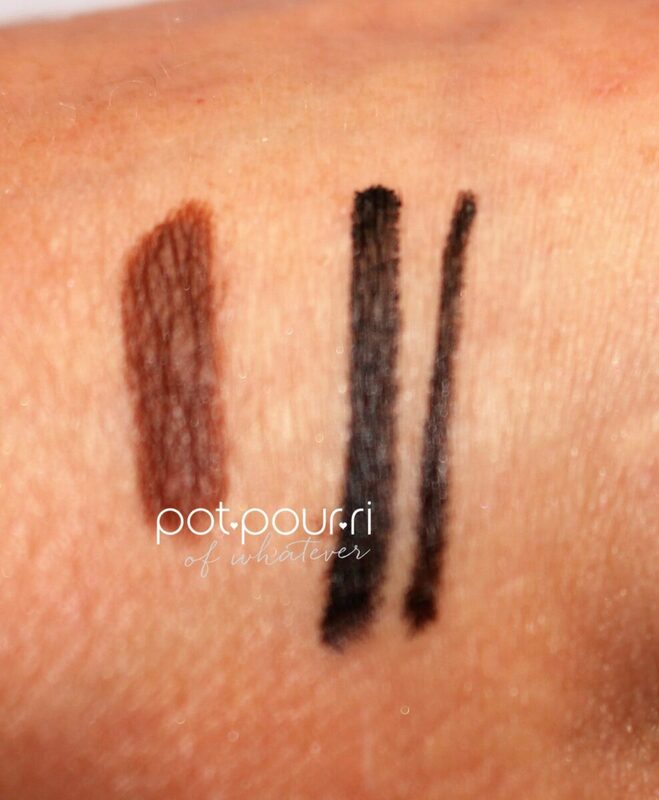 I use Brownie as a shadow, I put a moist eye primer on the lid, and quickly color my lids, and then I use my finger to smudge it outwards. I like using these as shadows because of their longevity. I also like to wear them as eyeliners, without tightlining. I just ordered a buff shade to use in the inner corners of my eyes to brighten the area. 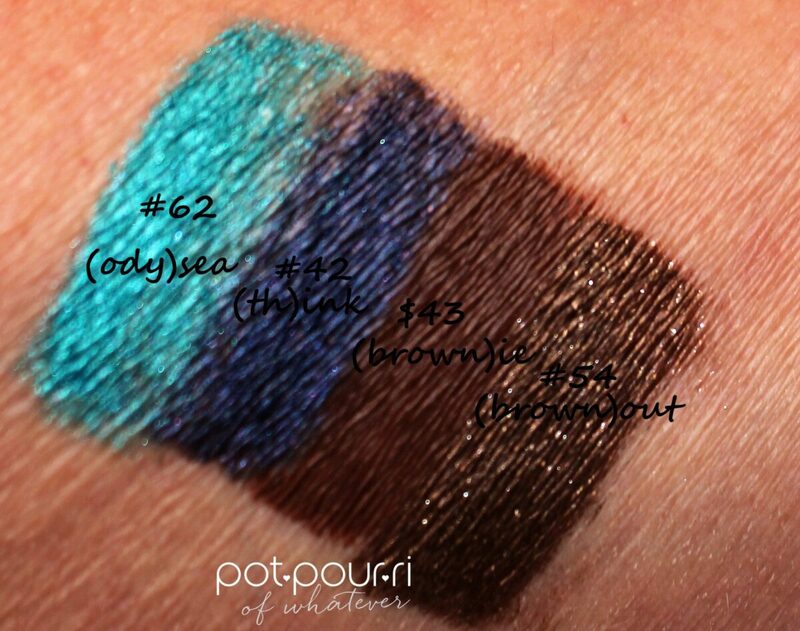 I love the Navy Blue shade to use on the outer corners of my eyes, as well as using it, and the teal as a liner and a shadow. These crayon shades are all buildable. Being that it is still hot outside, they are sweatproof, they do not melt. And best of all, my eyes do not burn and are not runny. Hooray for that! Who wants to get all made up and have it just run all over your face because your eyes are tearing. These are definitely my favorite eyeliner crayons. The gel formula is amazing, stays forever, and I love the variety of shades and finishes they come in. I also like that if you are really precise ( Not me) the fineliner is super thin and easy to line your eyes. They are both amazing for tightlining. I like the versatility of these eyeliner gel crayons, because they do more than just eyelines, they can be smudged out as a shadow! Or, a long-lasting shadow base! Or a highlighter if you go with a light shade. What do you think of these Gel Crayons?